A New York Times, Los Angeles Times, USA Today, and IndieBound bestseller that Fortune says is a must-read for any entrepreneur! The dynamic, game-changing guide to finding success and fearlessly outsmarting the system. In Hustle, Neil Patel, Patrick Vlaskovits, and Jonas Koffler—three of the nation’s top entrepreneurs and consultants—have teamed up to teach you how to look at work and life through a new lens—one based on discovering projects you enjoy and the people and opportunities that support your talents, growth, income, and happiness. More than just an inspirational career guide, Hustle aims to fundamentally transform the way you work and live, and give yourself permission to thrive in today’s uncertain world. NEIL PATEL is the co-founder of Crazy Egg and Hello Bar. He helps companies like NBC, GM, HP, and Viacom grow their revenue. The Wall Street Journal calls him a top influencer on the web, Forbes says he is one of the top 10 online marketers, and Entrepreneur Magazine says he created one of the 100 most brilliant companies in the world. He lives in Seattle, Washington. JONAS KOFFLER is a creative media consultant, producer, and writer. He advises internationally recognized thought leaders and creative artists, helps organizations innovate, develops strategy and intellectual property for startups and billion-dollar companies alike, and has contributed to multiple bestselling books. He lives in Austin, Texas. 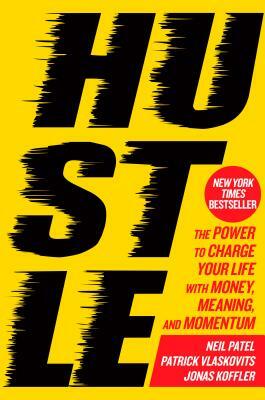 "The authors of Hustle traded in the humdrum corporate life for one of opportunity and adventure. If you’re looking for the same kind of exit ramp, read this book, soak up its contagious energy, and get ready to do some hustling." "An important book that will show you how to build the bridge between your potential and the opportunities that are waiting for you—if you choose to go after them." "Hustle is the blueprint I followed to land three dream jobs in a row. Stop trying to convince people to hire you, and show them what you can do." "Hustle will help you explore your unique talents and quirks, and discover more fulfillment in the process." "To get ahead, above all else, respect yourself and your talents. Hustle is a manifesto for doing just that."